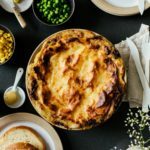 A luxurious take on the ever classic lamb shepherd's pie – perfect for Easter! I love shepherd’s pie with a passion. 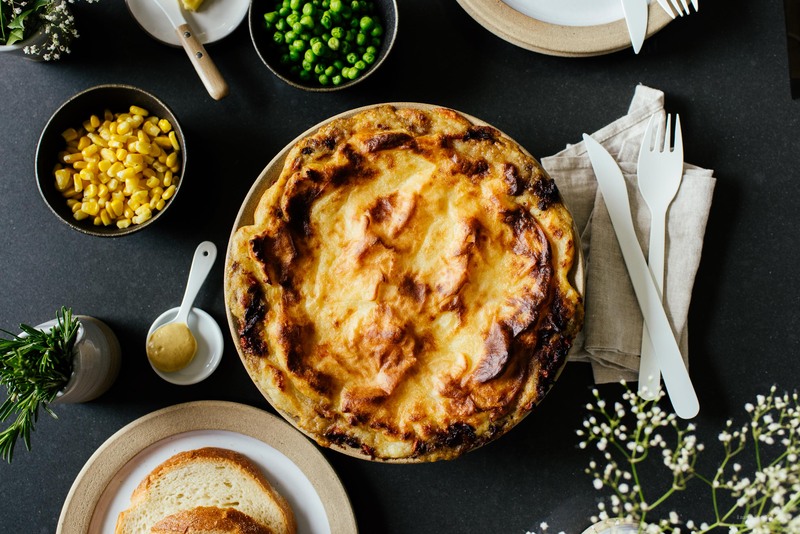 Well, wait, let me correct that statement: I love cottage pies because that’s what I grew up with, the main difference between shepherd’s and cottage being what kind of meat you use. 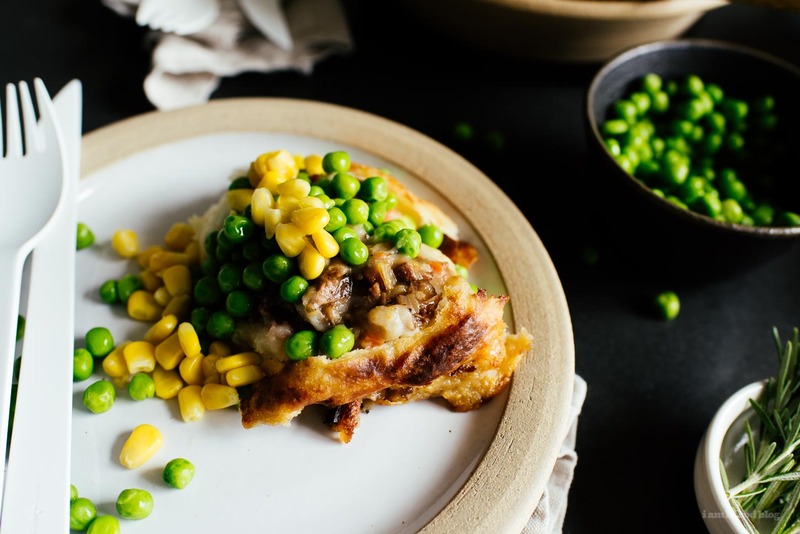 Shepherd’s pies are made with lamb because shepherds herd sheep and cottage pies are called cottage because…well, I’m not too sure where that one comes from. To me, there’s nothing more comforting than the combination of meat and vegetables topped off with smooth rich mashed potatoes. Shepherd’s pie will always be one of my favorite foods, one that makes me feel all-is-right-with-the-world-kinda-fuzzy. Serve me a shepherd’s pie and I am one happy person. Which is what Mike did, in the thick of winter, on a particularly heavy snow day. He told me to cozy out, and watch the snow fall, wrapped up in a blanket, while he made me dinner. Then he one-upped himself and told me that he was going to make me not one, but two(!) shepherd’s pies so I could do a little compare and contrast. It was pretty exciting, I have to admit. Mike picked out two British recipes: Jamie Oliver’s and Gordon Ramsay’s. Going into it, we both thought that Ramsay’s recipe was going to be the clear winner, but it turned out that we were both blown away by Oliver’s! It was so good I had to make it again and again and again. As a potato-lover, I love how the potatoes surround the lamb filling, which is incredibly savory due to the fact that it’s bone-in roasted lamb instead of the typical mince. I did modify the potato recipe a little bit, pushing the boiled potatoes through a sieve for extra smoothness and stirring in some sour cream for a bit of tang, which went well with the richness of the lamb filling. 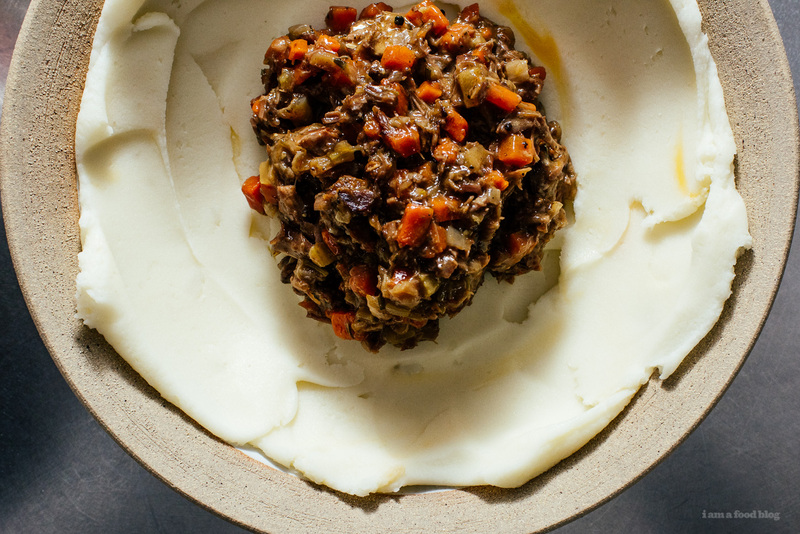 This recipe is a little bit of a time investment, but it’s mostly hands off and I think it’s perfect as an Easter dish: just a touch more fancy than your regular shepherd’s pie, but just as comforting. 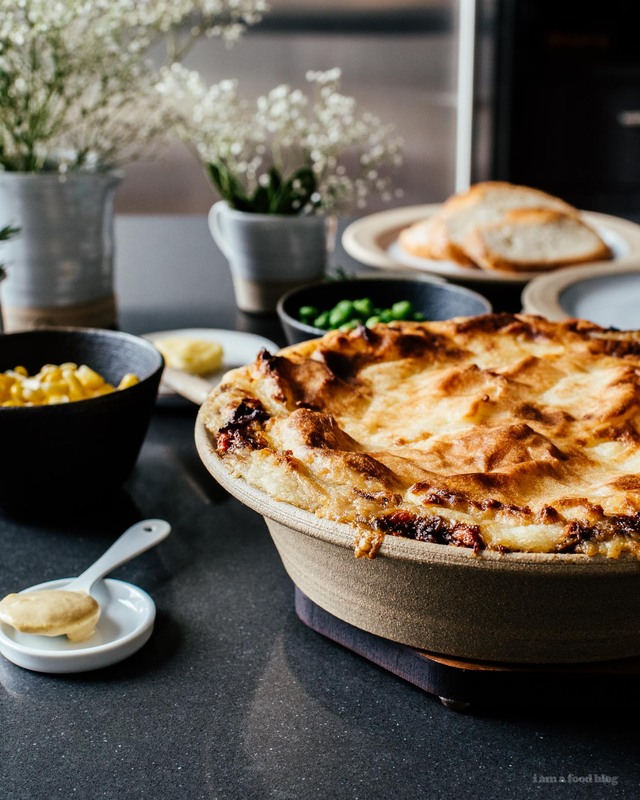 Jamie’s full recipe calls for 2 kg of bone-in-lamb and makes enough to fill two standard quarter sheet pie pans. In this version, I quartered his filling so that 1.) it only makes enough for one pie and 2.) it fits the standard smaller round pie pan we use in North America. That’s why there is only 1/2kg (or 1 lb) of meat! Generously rub the lamb chop with a bit of oil and season generously, on all sides. Place into a snug-fitting high sided oven safe dish and add a bit of water to the bottom. Roast for 2 hours, or until the meat is tender and falling off the bone. Remove the lamb from the oven and let cool slightly. 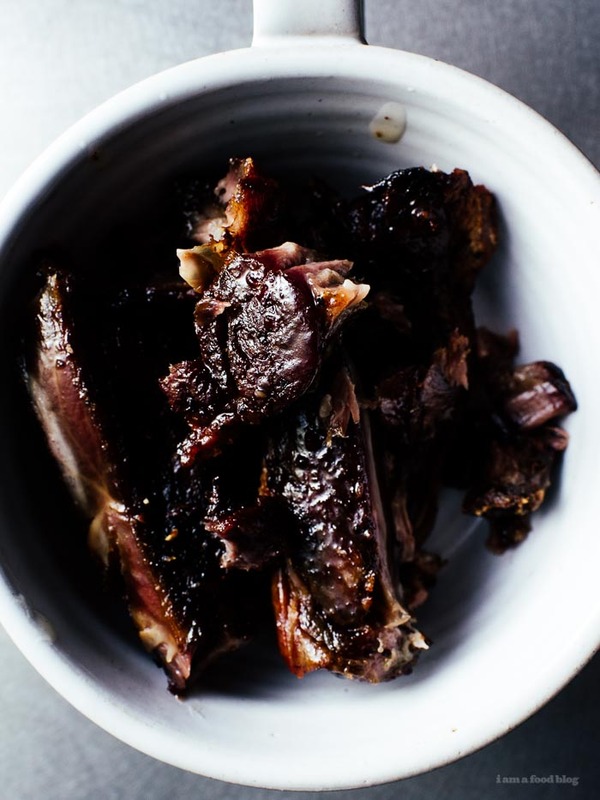 Take the lamb off the bone and roughly chop, being sure to save the bones, fat, and accumulated juices from roasting. There should be about 2 tablespoons of fat in the roasting tray. Place into a high sided pan and heat over medium. Add the onion, carrot, celery, and rosemary. Cook, stirring, until lightly caramelized, about 10 minutes. Sprinkle on the flour and stir well. Add the lamb, bones, and tray juices to the pan, as well as 1.5 cups of water. Bring to a boil and turn the heat down to a gentle simmer, reducing until you get a loose, lamb stew. Season with salt and pepper. While the lamb is cooking down, prepare your potatoes. Bring a large pot of water to a boil and season with salt. Add the potatoes and cook until very tender, 15-20 minutes. Drain, then mash (I pushed my potatoes through a sieve for extra smoothness) and mix in the butter, milk, sour cream, and cheddar. Taste, adjust with extra milk and butter if needed, and season. 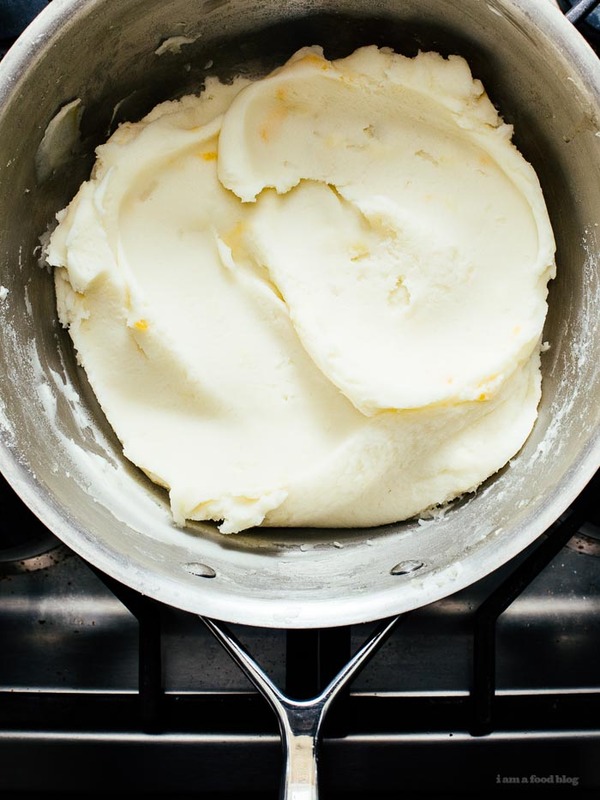 In a pie dish, spread a thin layer of potato on the bottom and sides. Spoon in the lamb filling and then cover with the remaining mashed potatoes. Top with dabs of butter, if desired. 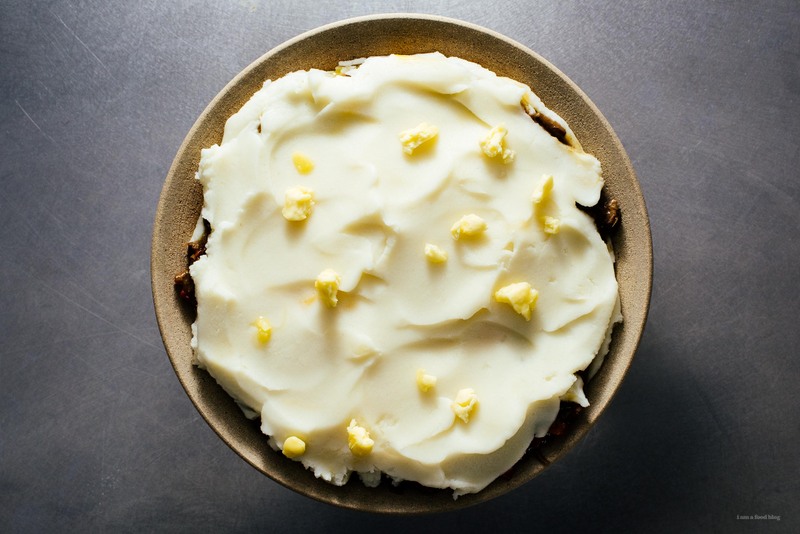 Bake for 1 hour, until the top is crisp and golden. Enjoy! As soon as I am off my low carb diet I am going to give this a go! I was just trying to figure out what to eat for Easter, only knowing that I wanted lamb. And here you come through! This looks fantastic. I’m not surprised that Jamie Oliver won the taste off- he’s sneaky like that. I think this one is the best pie. This is great recipe. I guess potatoes and meat are really good combination!! l want to try this recipe. Omg that looks so amazing! I’ve got to attempt to make this this weekend. I am amazed! I can’t imagine how good it tastes. Just saw this and it looks like a must try. The quantity of lamb struck me as a bit skimpy, however, so I Googled Jamie’s recipe and found that he calls for 1 kg. of lamb, not 1 lb. Darn that metric system! OMG! One of the very best shepherds pies I have ever tasted. I made it for a sick friend because they wanted real lamb and not mince. A definite winner and 5 STARS! sounds delice gotta give it a try.